It remains a mystery why the very real collapse in home values, amounting to two or three trillion dollars, caused a world-wide decline in asset values of more like 60-80 trillion. Eric Falkenstein acknowledges that “No one knows how such small losses amplify in size and scope to create economy-wide downturns, because we have no good theory for it.” Nevertheless, he offers some suggestions, which relate in part to the concept of “vega.” “Vega is the change in option value given a change in volatility.” To understand more, read the whole thing. In contrast, the tech bubble of 2001 had fairly limited affect on banks because most of the value destruction was in the equity, private capital. Thus banks were quickly back in the positive vega zone and the recession was pretty small. 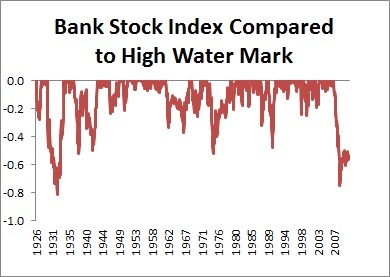 In contrast, bank stocks today are still well below prior highs. Below is a graph of the drawdown from the prior peak for the bank stock index, as generated via Ken French’s data. The past peak is a high water mark, so it tops out at zero, but in recessions falls (IndexValue/Max(prior Index values)-1). The current drawdown is comparable to that in the great Depression, and notice it is still at historic lows (data is through October 2011). Ken French is a very well known finance theory pioneer at Tuck. “Vega” is the functional relationship between change in the volatility of the underlying asset in an option and the option’s value. Option value is extremely sensitive to asset value volatility so even though vega is a second order measure (change in the option value per change in the rate of change of the asset value) it is important in understanding option values. That in turn is important because securities in a firm, debt and equity, can be modeled and understood as options of various forms on the asset value of the firm (not its equity value or market cap). This is all fundamental in modern finance. The significance of all this is in figuring out how drops in values of sub prime mortgages and residential real estate transformed into a massive run on the entire banking system….the crash in values was far greater than the fundamentals of the real estate/mortgage crash. This is a theory of how that happened. It amounts to an elaboration of the concept that fractional reserve banks are uniquely fragile….subject to runs and “contagion” as change in asset volatility gets leveraged into (adverse) change in securities value to the point of default or bank failure. And it’s self reinforcing, of course, once the run starts. The chart shows how severely banks’ value has been damaged….comparable to the Depression….so how did the “bailout” work again?